From a late 19th century introduction to a book of poetry by Lowell, published by Houghton Mifflin. About half a mile from the Craigie House in Cambridge, Massachusetts, on the road leading to the old town of Watertown, is Elmwood, a spacious square house set amongst lilac and syringa bushes, and overtopped by elms. Pleasant fields are on either side, and from the windows one may look out on the Charles River winding its way among the marshes. The house itself is one of a group which before the war for independence belonged to Boston merchants and officers of the crown who refused to take the side of the revolutionary party. Tory Row was the name given to the broad winding road on which the houses stood. Great farms and gardens were attached to them, and some sign of their roomy ease still remains. The estates fell into the hands of various persons after the war, and in process of time Longfellow came to occupy Craigie House. Elmwood at that time was the property of the Reverend Charles Lowell, minister of the West Church in Boston, and when Longfellow thus became his neighbor, James Russell Lowell was a junior in Harvard College. He was born at Elmwood, February 22, 1819. Any one who will read An Indian Summer Reverie will discover how affectionately Lowell dwelt on the scenes of nature and life amidst which he grew up. Indeed, it would be a pleasant task to draw from the full storehouse of his poetry the golden phrases with which he characterizes the trees, meadows, brooks, flowers, birds, and human companions that were so near to him in his youth and so vivid in his recollection. In his prose works also a lively paper, Cambridge Thirty Years Ago, contains many reminiscences of his early life. To know any one well it is needful to inquire into his ancestry, and two or three hints may be given of the currents that met in this poet. On his father's side he came from a succession of New England men who for the previous three generations had been in professional life. The Lowells traced their descent from Percival Lowell,—a name which survives in the family,—of Bristol, England, who settled in Newbury, Massachusetts, in 1639. The great-grandfather was a minister in Newburyport, one of those, as Dr. Hale says, "who preached sermons when young men went out to fight the French, and preached sermons again in memory of their death when they had been slain in battle." The grandfather was John Lowell, a member of the Constitutional Convention of Massachusetts in 1780. It was he who introduced into the Bill of Rights a phrase from the Bill of Rights of Virginia, "All men are created free and equal," with the purpose which it effected of setting free every man then held as a slave in Massachusetts. A son of John Lowell and brother of the Rev. Charles Lowell was Francis Cabot Lowell, who gave a great impetus to New England manufactures, and from whom the city of Lowell took its name. Another son, and thus also an uncle of the poet, was John Lowell, Jr., whose wise and far-sighted provision gave to Boston that powerful centre of intellectual influence, the Lowell Institute. Of the Rev. Charles Lowell, his son said, in a letter written in 1844, "He is Doctor Primrose in the comparative degree, the very simplest and charmingest of sexagenarians, and not without a great deal of the truest magnanimity." It was characteristic of Lowell thus to go to The Vicar of Wakefield for a portrait of his father. Dr. Lowell lived till 1861, when his son was forty-two. Elmwood, Mr. Lowell's home in Cambridge. Mrs. Harriet Spence Lowell, the poet's mother, was of Scotch origin, a native of Portsmouth, New Hampshire. She is described as having "a great memory, an extraordinary aptitude for language, and a passionate fondness for ancient songs and ballads." It pleased her to fancy herself descended from the hero of one of the most famous ballads, Sir Patrick Spens, and at any rate she made a genuine link in the Poetic Succession. In a letter to his mother, written in 1837, Lowell says: "I am engaged in several poetical effusions, one of which I have dedicated to you, who have always been the patron and encourager of my youthful muse." The Russell in his name seems to intimate a strain of Jewish ancestry; at any rate Lowell took pride in the name on this account, for he was not slow to recognize the intellectual power of the Hebrew race. He was the youngest of a family of five, two daughters and three sons. An older brother who outlived him a short time, was the Rev. Robert Traill Spence Lowell, who wrote besides a novel, The New Priest in Conception Bay, which contains a delightful study of a Yankee, some poems, and a story of school-boy life. 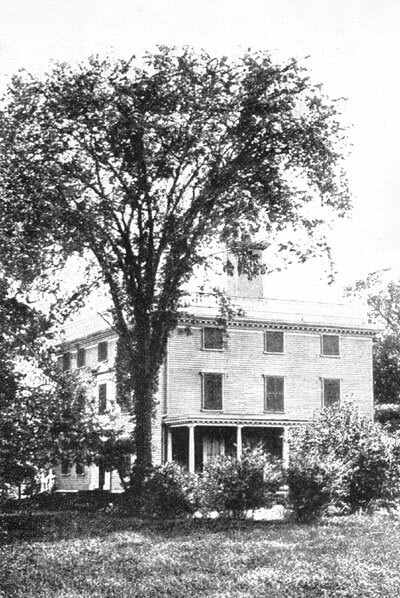 Not long before his death, Lowell wrote to an English friend a description of Elmwood, and as he was very fond of the house in which he lived and died, it is agreeable to read words which strove to set it before the eyes of one who had never seen it. "'Tis a pleasant old house, just about twice as old as I am, four miles from Boston, in what was once the country and is now a populous suburb. But it still has some ten acres of open about it, and some fine old trees. When the worst comes to the worst (if I live so long) I shall still have four and a half acres left with the house, the rest belonging to my brothers and sisters or their heirs. It is a square house, with four rooms on a floor, like some houses of the Georgian era I have seen in English provincial towns, only they are of brick, and this is of wood. But it is solid with its heavy oaken beams, the spaces between which in the four outer walls are filled in with brick, though you mustn't fancy a brick-and-timber house, for outwardly it is sheathed with wood. Inside there is much wainscot (of deal) painted white in the fashion of the time when it was built. It is very sunny, the sun rising so as to shine (at an acute angle to be sure) through the northern windows, and going round the other three sides in the course of the day. There is a pretty staircase with the quaint old twisted banisters,—which they call balusters now; but mine are banisters. My library occupies two rooms opening into each other by arches at the sides of the ample chimneys. The trees I look out on are the earliest things I remember. There you have me in my new-old quarters. But you must not fancy a large house—rooms sixteen feet square, and on the ground floor, nine high. It was large, as things went here, when it was built, and has a certain air of amplitude about it as from some inward sense of dignity." In an earlier letter he wrote: "Here I am in my garret. I slept here when I was a little curly-headed boy, and used to see visions between me and the ceiling, and dream the so often recurring dream of having the earth put into my hand like an orange. In it I used to be shut up without a lamp,—my mother saying that none of her children should be afraid of the dark,—to hide my head under the pillow, and then not be able to shut out the shapeless monsters that thronged around me, minted in my brain.... In winter my view is a wide one, taking in a part of Boston. I can see one long curve of the Charles and the wide fields between me and Cambridge, and the flat marshes beyond the river, smooth and silent with glittering snow. As the spring advances and one after another of our trees puts forth, the landscape is cut off from me piece by piece, till, by the end of May, I am closeted in a cool and rustling privacy of leaves." In two of his papers especially, My Garden Acquaintance and A Good Word for Winter, has Lowell given glimpses of the out-door life in the midst of which he grew up. His acquaintance with books and his schooling began early. He learned his letters at a dame school. Mr. William Wells, an Englishman, opened a classical school in one of the spacious Tory Row houses near Elmwood, and, bringing with him English public school thoroughness and severity, gave the boy a drilling in Latin, which he must have made almost a native speech to judge by the ease with which he handled it afterward in mock heroics. Of course he went to Harvard College. He lived at his father's house, more than a mile away from the college yard; but this could have been no great privation to him, for he had the freedom of his friends' rooms, and he loved the open air. The Rev. Edward Everett Hale has given a sketch of their common life in college. "He was a little older than I," he says, "and was one class in advance of me. My older brother, with whom I lived in college, and he were most intimate friends. He had no room within the college walls, and was a great deal with us. The fashion of Cambridge was then literary. Now the fashion of Cambridge runs to social problems, but then we were interested in literature. We read Byron and Shelley and Keats, and we began to read Tennyson and Browning. I first heard of Tennyson from Lowell, who had borrowed from Mr. Emerson the little first volume of Tennyson. We actually passed about Tennyson's poems in manuscript. Carlyle's essays were being printed at the time, and his French Revolution. In such a community—not two hundred and fifty students all told,—literary effort was, as I say, the fashion, and literary men, among whom Lowell was recognized from the very first, were special favorites. Indeed, there was that in him which made him a favorite everywhere." Lowell was but fifteen years old when he entered college in the class which graduated in 1838. He was a reader, as so many of his fellows were, and the letters which he wrote shortly after leaving college show how intent he had been on making acquaintance with the best things in literature. He began also to scribble verse, and he wrote both poems and essays for college magazines. His class chose him their poet for Class Day, and he wrote his poem; but he was careless about conforming to college regulations respecting attendance at morning prayers; and for this was suspended from college the last term of his last year, and not allowed to come back to read his poem. "I have heard in later years," says Dr. Hale, "what I did not know then, that he rode down from Concord in a canvas-covered wagon, and peeped out through the chinks of the wagon to see the dancing around the tree. I fancy he received one or two visits from his friends in the wagon; but in those times it would have been treason to speak of this." He was sent to Concord for his rustication, and so passed a few weeks of his youth amongst scenes dear to every lover of American letters. After his graduation he set about the study of law, and for a short time even was a clerk in a counting-room; but his bent was strongly toward literature. There was at that time no magazine of commanding importance in America, and young men were given to starting magazines with enthusiasm and very little other capital. Such a one was the Boston Miscellany, launched by Nathan Hale, Lowell's college friend, and for this Lowell wrote gaily. It lived a year, and shortly after Lowell himself, with Robert Carter, essayed The Pioneer in 1843. It lived just three months; but in that time printed contributions by Lowell, Hawthorne, Whittier, Story, Poe, and Dr. Parsons,—a group which it would be hard to match in any of the little magazines that hop across the world's path to-day. Lowell had already collected, in 1841, the poems which he had written and sometimes contributed to periodicals into a volume entitled A Year's Life; but he retained very little of the contents in later editions of his poems. The book has a special interest, however, from its dedication in veiled phrase to Maria White. He became engaged to this lady in the fall of 1840, and the next twelve years of his life were profoundly affected by her influence. Herself a poet of delicate power, she brought into his life an intelligent sympathy with his work; it was, however, her strong moral enthusiasm, her lofty conception of purity and justice, which kindled his spirit and gave force and direction to a character which was ready to respond, and yet might otherwise have delayed active expression. They were not married until 1844; but they were not far apart in their homes, and during these years Lowell was making those early ventures in literature, and first raids upon political and moral evil, which foretold the direction of his later work, and gave some hint of its abundance. At the head of a march to the last new Jerusalem. This, of course, is but a half serious portrait of himself, and it touches but a single feature; others can say better that Lowell's ardent nature showed itself in the series of satirical poems which made him famous, The Biglow Papers, written in a spirit of indignation and fine scorn, when the Mexican War was causing many Americans to blush with shame at the use of the country by a class for its own ignoble ends. Lowell and his wife, who brought a fervid anti-slavery temper as part of her marriage portion, were both contributors to the Liberty Bell; and Lowell was a frequent contributor to the Anti-Slavery Standard, and was, indeed, for a while a corresponding editor. In June, 1846, there appeared one day in the Boston Courier a letter from Mr. Ezekiel Biglow of Jaalam to the editor, Hon. Joseph T. Buckingham, inclosing a poem of his son, Mr. Hosea Biglow. It was no new thing to seek to arrest the public attention with the vernacular applied to public affairs. Major Jack Downing and Sam Slick had been notable examples, and they had many imitators; but the reader who laughed over the racy narrative of the unlettered Ezekiel, and then took up Hosea's poem and caught the gust of Yankee wrath and humor blown fresh in his face, knew that he was in at the appearance of something new in American literature. The force which Lowell displayed in these satires made his book at once a powerful ally of an anti-slavery sentiment, which heretofore had been ridiculed. A year in Europe, 1851-1852, with his wife, whose health was then precarious, stimulated his scholarly interests, and gave substance to his study of Dante and Italian literature. In October, 1853, his wife died; she had borne him three children: the first-born, Blanche, died in infancy; the second, Walter, also died young; the third, a daughter, Mrs. Burnett, survived her parents. In 1855 he was chosen successor to Longfellow as Smith Professor of the French and Spanish Languages and Literature, and Professor of Belles Lettres in Harvard College. He spent two years in Europe in further preparation for the duties of his office, and in 1857 was again established in Cambridge, and installed in his academic chair. He married, also, at this time Miss Frances Dunlap, of Portland, Maine. Lowell was now in his thirty-ninth year. As a scholar, in his professional work, he had acquired a versatile knowledge of the Romance languages, and was an adept in old French and Provençal poetry; he had given a course of twelve lectures on English poetry before the Lowell Institute in Boston, which had made a strong impression on the community, and his work on the series of British Poets in connection with Professor Child, especially his biographical sketch of Keats, had been recognized as of a high order. In poetry he had published the volumes already mentioned. In general literature he had printed in magazines the papers which he afterward collected into his volume, Fireside Travels. Not long after he entered on his college duties, The Atlantic Monthly was started, and the editorship given to him. He held the office for a year or two only; but he continued to write for the magazine, and in 1862 he was associated with Mr. Charles Eliot Norton in the conduct of The North American Review, and continued in this charge for ten years. Much of his prose was contributed to this periodical. Any one reading the titles of the papers which comprise the volumes of his prose writings will readily see how much literature, and especially poetic literature, occupied his attention. Shakespeare, Dryden, Lessing, Rousseau, Dante, Spenser, Wordsworth, Milton, Keats, Carlyle, Percival, Thoreau, Swinburne, Chaucer, Emerson, Pope, Gray,—these are the principal subjects of his prose, and the range of topics indicates the catholicity of his taste. In these papers, when studying poetry, he was very alive to the personality of the poets, and it was the strong interest in humanity which led Lowell, when he was most diligent in the pursuit of literature, to apply himself also to history and politics. Several of his essays bear witness to this, such as Witchcraft, New England Two Centuries Ago, A Great Public Character (Josiah Quincy), Abraham Lincoln, and his great Political Essays. But the most remarkable of his writings of this order was the second series of The Biglow Papers, published during the war for the Union. In these, with the wit and fun of the earlier series, there was mingled a deeper strain of feeling and a larger tone of patriotism. The limitations of his style in these satires forbade the fullest expression of his thought and emotion; but afterward in a succession of poems, occasioned by the honors paid to student soldiers in Cambridge, the death of Agassiz, and the celebration of national anniversaries during the years 1875 and 1876, he sang in loftier, more ardent strains. The most famous of these poems was his noble Commemoration Ode. It was at the close of this period, when he had done incalculable service to the Republic, that Lowell was called on to represent the country, first in Madrid, where he was sent in 1877, and then in London, to which he was transferred in 1880. Eight years were thus spent by him in the foreign service of the country. He had a good knowledge of the Spanish language and literature when he went to Spain; but he at once took pains to make his knowledge fuller and his accent more perfect, so that he could have intimate relations with the best Spanish men of the time. In England he was at once a most welcome guest, and was in great demand as a public speaker. No one can read his dispatches from Madrid and London without being struck by his sagacity, his readiness in emergencies, his interest in and quick perception of the political situation in the country where he was resident, and his unerring knowledge as a man of the world. Above all, he was through and through an American, true to the principles which underlie American institutions. His address on Democracy, which he delivered in England, is one of the great statements of human liberty. A few years later, after his return to America, he gave another address to his own countrymen on The Place of the Independent in Politics. It was a noble defense of his own position, not without a trace of discouragement at the apparently sluggish movement in American self-government of recent years, but with that faith in the substance of his countrymen which gave him the right to use words of honest warning. The public life of Mr. Lowell made him more of a figure before the world. He received honors from societies and universities; he was decorated by the highest honors which Harvard could pay officially; and Oxford and Cambridge, St. Andrews and Edinburgh and Bologna, gave gowns. He established warm personal relations with Englishmen, and, after his release from public office, he made several visits to England. There, too, was buried his wife, who died in 1885. The closing years of his life in his own country, though touched with domestic loneliness and diminished by growing physical infirmities that predicted his death, were rich also with the continued expression of his large personality. He delivered the public address in commemoration of the 250th anniversary of the founding of Harvard University; he gave a course of lectures on the Old English Dramatists before the Lowell Institute; he collected a volume of his poems; he wrote and spoke on public affairs; and, the year before his death, revised, rearranged, and carefully edited a definitive series of his writings in ten volumes. He died at Elmwood, August 12, 1891. Since his death three small volumes have been added to his collected writings, and Mr. Norton has published Letters of James Russell Lowell, in two volumes.